Last year, Apple released its fifth generation of the iPad at a starting price point of $329. Considering all the new tech they included in the device, the lower price was a nice surprise relative to the price of previous generations of the iPad which were typically in the $499 -$599 range. This latest iPad will also start at $329 and gets you 32GB of space to work with; the price increases relative to the capacity of the device. If you find yourself constantly busy in multiple apps, this update might be of importance to you. The new iPad uses what Apple is calling the “A10 Fusion chip”, which boasts 40% faster CPU and 50% faster graphics performance compared to the fifth generation iPad. You should see improved performance when using graphics-intensive apps and if you’re using multiple apps at a time. Remember when the iPad Pro was released and Apple released a neat stylus tool called the Apple Pencil to go with it? 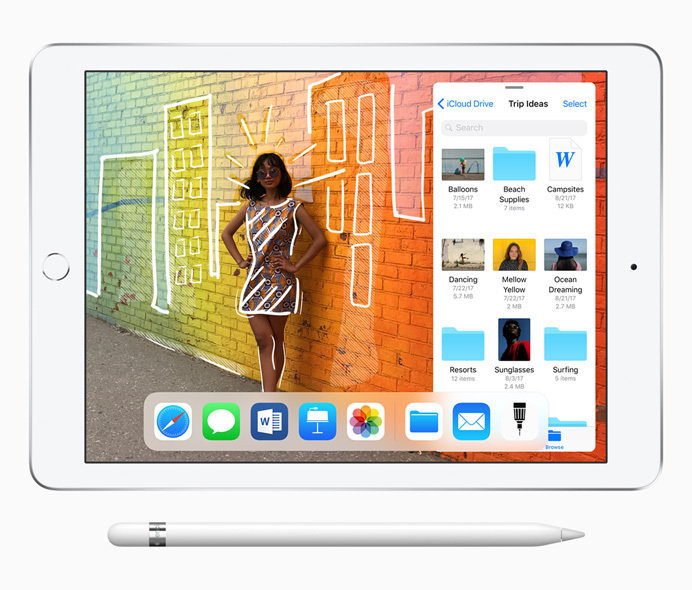 Previously, the Apple Pencil has only been available for the iPads in the Pro line, the 10.5-inch, and the 12.9 inch. The new iPad will provide support for use of the Pencil, so you can draw and write all over the screen just as simply as if you were writing on paper. It should be noted that the Pencil is sold separately to the tune of $99. Aside from the processor and Pencil support upgrades, it doesn’t seem as though a whole lot has changed with the release of the new iPad. It is very comparable to the fifth generation iPad that came before it: 9.7-inch Retina display, enhanced speakers, same camera specs, Touch ID home button, no Smart Connector for attaching a Smart Keyboard, support for iOS 11. There’s not much else to it. My opinion? If you use your iPad for typical things like checking email, browsing the internet, utilizing some of your favorite apps and you also like the idea of being able to use the Apple Pencil but don’t feel as though you need all of the power of the iPad Pro (and want to spend a little less), the new iPad + Pencil combo might be a nice compromise and a good buy. Otherwise, you’re probably just as well off with your current iPad (no matter the generation or model) so long as it still runs well for you.